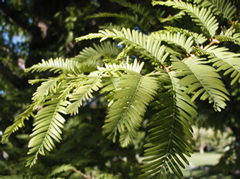 Dawn redwood is a native of China first discovered in 1941 but not correctly classified until 1948. 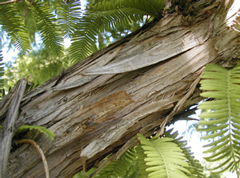 Its name comes from the Greek word meta, which means like or akin and sequoia because it resembles the coastal redwood. The species name glyptostroboides refers to the genus Glyptostrobus, which is the genus name for Chinese swamp cypress. 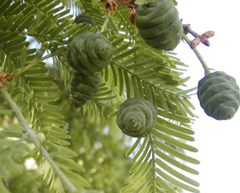 Early specimens of Dawn Redwood were thought to be that of the Chinese swamp cypress. Hardiness Zones 4 to 8. 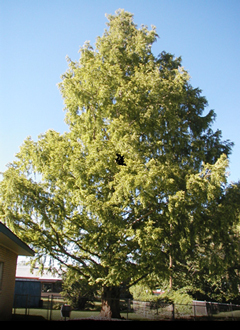 Growth habit Tree has an excurrent pyramidal growth habit with bright green lacy foliage. Trees produce a filtered shade that accommodates turf growing underneath the tree. Tree could grow to a height of 65 feet with a corresponding width of 25 feet in the urban forest. 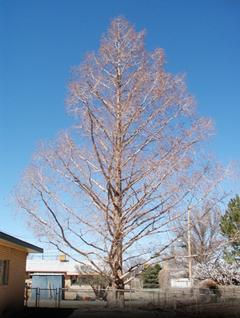 There is a specimen in Grand Junction, Colorado that is 53 feet tall. Foliage Attractive needle-like foliage is arranged in an opposite pattern along the leaf stem. Color is bright green on the upper surface and a lighter green below. Leaves turn a bright copper red in the autumn before falling off. Fruit Cones are three quarter to one inch in length when mature, bright green in color like the foliage. Male and female flowers are found on the same tree. Bark As tree matures the bark begins to flake off in long narrow strips, which is an attractive winter feature for this deciduous conifer. Twigs Green in color on one year old wood turning grayish brown the second year. Insects and diseases Pests have not been observed on Colorado planted material. Landscape value All reference literature states that this tree prefers well-drained acidic soil. There are several specimens in Grand Junction and one very nice tree growing in Glenwood Springs all are doing very well. The soils in Grand Junction are usually alkaline in nature and clay-like in texture where these trees are thriving. This would be a great tree to add species diversity in parks or on golf courses.